The interesting objects in the foreground are the fruits of the hop hornbeam tree. They are so beautiful, and at first I wasn’t sure why they looked Japanese to me. Then I remembered a book of Japanese crafts from the library, which shows you how to make a silk pouch that looks a lot like these fruits. The book, by Kumiko Sudo, is called Omiyage, which means, “the giving of gifts.” The pouch in the book is actually called a “pine-cone pouch,” though the tree is called a hop hornbeam because the fruit looks like hops. So I guess there are similarities between hops and pinecones, too. 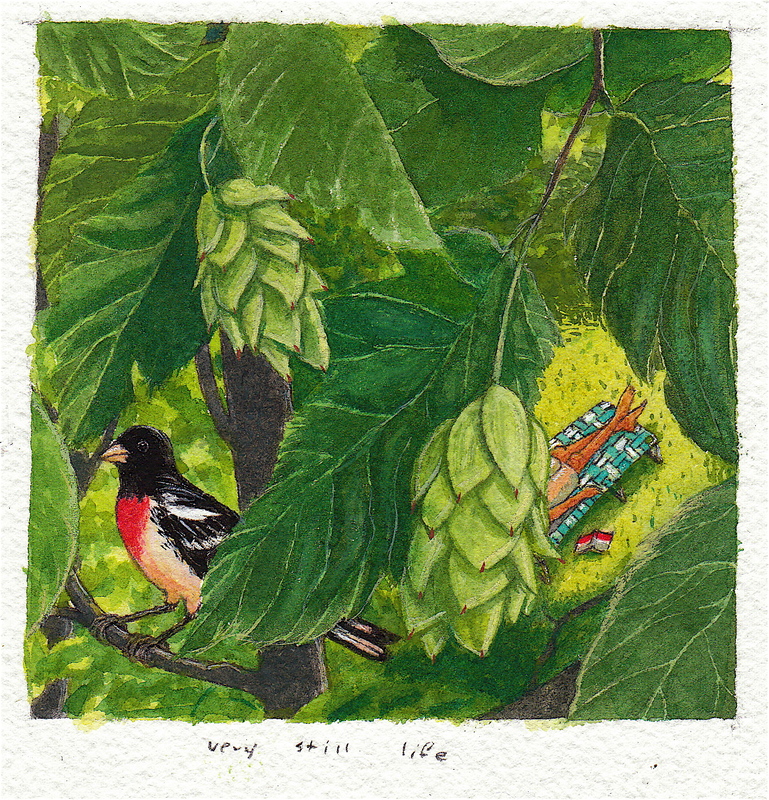 While I was painting the hop hornbeam fruits, I decided to throw in a rose-breasted grosbeak, for color. We saw one just the other day. So gorgeous. Then I just couldn’t resist painting some raspberries. They’re all over the place. So delicious. If I had to forage for my existence, I would never survive, unless it was a day in mid-July when the raspberries are ripe. 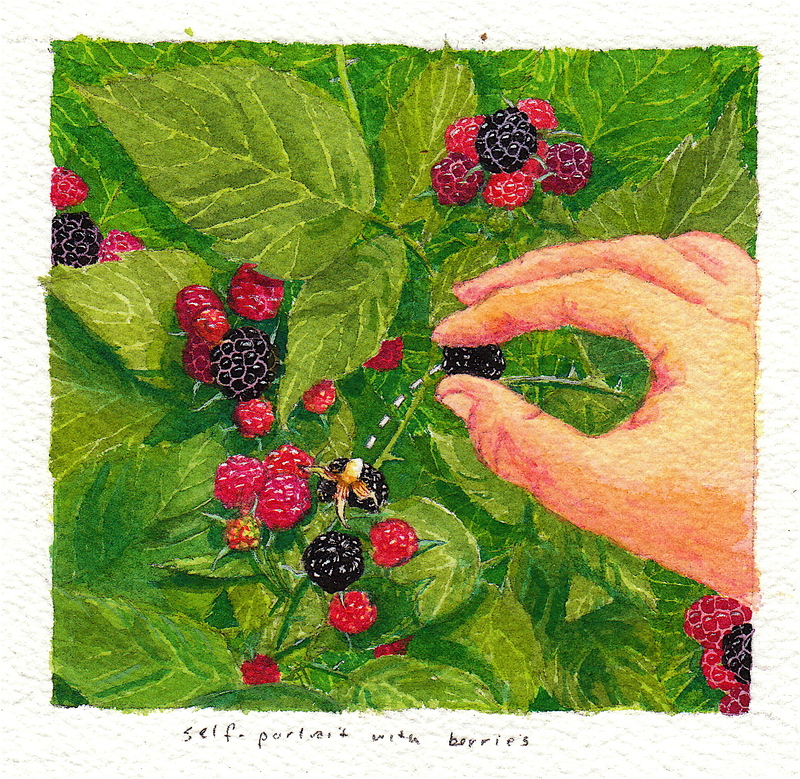 I call this one “Self-portrait with Raspberries.” It was the only way I could paint it, as I have never seen a bush of raspberries that my hand was not reaching into. Loved that book! Pretty sure I ordered it for the library. The world is so sweet right now. Thanks for stopping to notice! 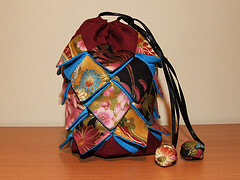 I always think I am the kind of person who will make one of those little pouches. But it turns out, I am not! I love this post. Hop hornbeam — we had one in our front yard in Leland. Raspberries — I plucked the first ripe middle berry of all the clusters on the canes that have volunteered in once was one of my flower gardens. (Have been wishing for a chaise longue. Wishing for time to stretch out in one, too.) Your paintings are lovely and make me smile. we can’t even call ours “a yard.” We live in a raspberry patch. These drawings explain why I love you! that’s the only reason I need to keep making them.